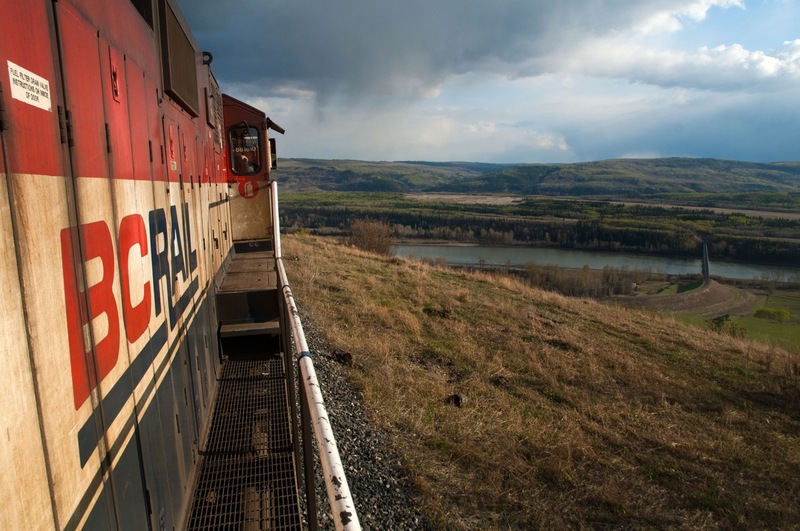 Railpictures.ca - Matt Watson Photo: Nothing says BC Rail like tough grades and remote country. Here is a view looking back as we head north from Taylor BC. Mile post 720 is on the opposite side of the unit, while mile 715 is at the curve just before the bridge over the Piece River, needless to say there are some steep grades in these 5 miles of former PGE track. Also worth mentioning is the remoteness of the area on the other side of the river (the south side). If you look to the right of the fire extinguisher symbol on the door of the unit you will notice a large break in the tree line, this is the gravel pit at Teko (around mile 713). To reach Teko by road from this same location one has to drive over 200km. | Railpictures.ca – Canadian Railway Photography – photographie ferroviaire Canadienne. Caption: Nothing says BC Rail like tough grades and remote country. Here is a view looking back as we head north from Taylor BC. Mile post 720 is on the opposite side of the unit, while mile 715 is at the curve just before the bridge over the Piece River, needless to say there are some steep grades in these 5 miles of former PGE track. Also worth mentioning is the remoteness of the area on the other side of the river (the south side). If you look to the right of the fire extinguisher symbol on the door of the unit you will notice a large break in the tree line, this is the gravel pit at Teko (around mile 713). To reach Teko by road from this same location one has to drive over 200km.